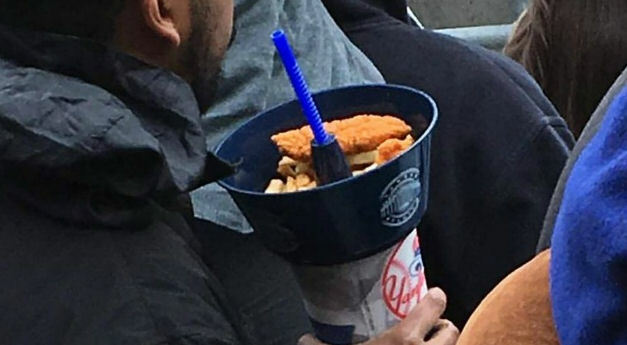 Have you ever been at a ballpark and had to navigate the crowds with a box of food and a drink and have been scared that the whole thing was going to fall over? It’s hard, right? Okay, well it’s not all that hard. But there seems to be a solution that has popped up at Yankee Stadium. It’s called “The Grub Tub“. It attaches to your big cup of souvenir soda as a lid, but it turns up as a bowl that you can put your food in. You can now pick the food out of your cup lid and drink your beverage at the same time! Think of how much faster and easier you can get sick! It’s not often that eating can be revolutionized, but I think eating at a ballgame has been revolutionized. Although I’m not sure how you would feel about drinking out of your popcorn. It might mess with your mind. But with less distraction, you can now watch more Yankee baseball per nine innings. Just in time for what is shaping up to be their worst season since the early nineties. Hooray for the Grub Tub.